SiliconDust teased about this yesterday, and it has finally come! Yes, today is the day that support for encrypted (CopyOnce) CableCARD premium channels comes to the Android ecosystem (excluding FireTV devices). 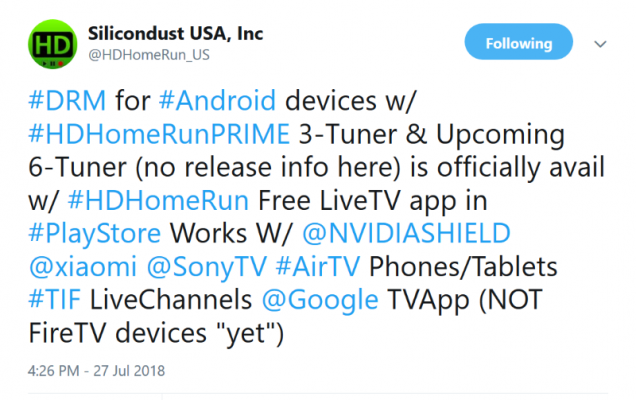 This means you can finally watch the whole lineup on your NVIDIA Shield, smart TVs running Android TV (e.g. Sony), or Android smart phone/tablet. Huzzah! We don’t have cable any more so I haven’t had a chance to test it, but I would love to hear about your experience. This is very welcome news. I just installed the HDHR DVR app update on my Shields and it works as advertised. I have a couple of TVs that have been sharing a HDHR Prime for watching live TV via Intel NUCs running WMC. I also use Shields at each TV for streaming content and also for accessing content on my server using Plex. I had originally hoped I could replace the WMC HTPCs with the Shields, but the lack of support for DRMed content was a showstopper. The lack of recording capability for said channels is not important because they’re only used for viewing live TV. The only problem I have now is getting the wife on board with using the Shields for live TV. My biggest gripe from day one about the HDHR DVR app is that it lacks a grid guide. The wife wants a grid guide so she can see what’s coming up and not just what’s currently on. A lot of people don’t seem to mind the lack of a grid style guide, but I just see it as a way SD is cutting corners to save money since they have to license they guide style from Rovi who apparently holds the copyright on it. The lack of a grid guide means that wifey will refuse to use the Shield in this manner so I’m basically back where I started. FYI to anyone wanting to upgrade their Shield with the latest HDHR app. After updating the app you need to reboot the Shield before you can view any DRMed channels. I’m on FIOS so that means any Fox network cable channels and any HBO channels. Once I rebooted the Shield they all came in just fine. FYI – To anyone using a Shield, the Google Live TV app has been updated to get rid of the tuner release bug so it frees up the tuner when you exit the app. The Live TV app does provide a grid style guide so that should make wifey happy. She can look at that to see what’s coming up and then use the HDHR app for watching all channels. It’s not the perfect solution, but it’s closer than what I had before. The inability of the DVR app (W10) to record protected content is a bit of a PITA, but it really only seems to impact HBO on our Comcast account. So I stream HBO, no biggie. I think this issue is one of the reasons the Kickstarter program hasn’t been fully met yet. I thought on the forum I saw a post that they are in the process of redesigning the interface and also the guide.